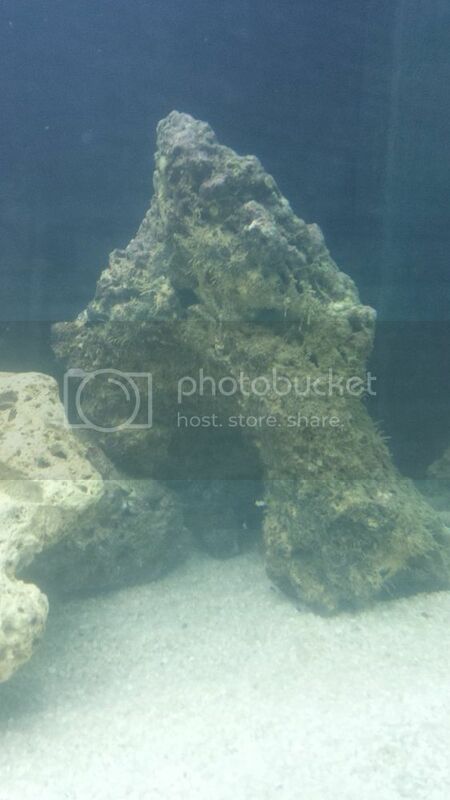 So my first tank is full of NSW, it has a couple of dry rocks, now all i need is live rock. Where do you get that from up in the N.T? Well we have one LFS that sells marine fish but they will only order it in if I buy a 200kg at a time and at a large markup too. So as it is legal here I am left to collect my own LR. There was a low tide this morning of 1.5m and I didn't start work until 3 so out I went. I'm 100% new to this and don't really have much of a clue what I was doing, thanks to a thread on RC about a guy up here that used to collect LR and coral I had a rough idea about a couple of locations that there are decent LR and corals to be collected (if you haven't seen his thread its amazing, its called "How rare is this?" on Reef Central). Anyway I am not sure I ended up in the same spot that this guy visits however I did come away with 3 medium rocks. Mostly because any rocks that I did like the look of seemed to be welded to the rock below them or they were just too large. The 3 I did end up with where hard enough to carry the km back to the car tomorrow I will try another spot and see how I go. Looking back this photo doesn't really show how far out the tide was but it's looking down the length of the beach with the water maybe 500m to the left. These crabs where everywhere. EVERYWHERE. Anyone have any idea what they are? I found one out of the water and he tried to play dead so scooped him into the bucket to try and get a better picture. As soon as he was in the bucket he became very snappy. This is a piece of LR that I was going to take but I don't know what the white stuff is. It was spongy and I didn't feel comfortable putting it in my tank. 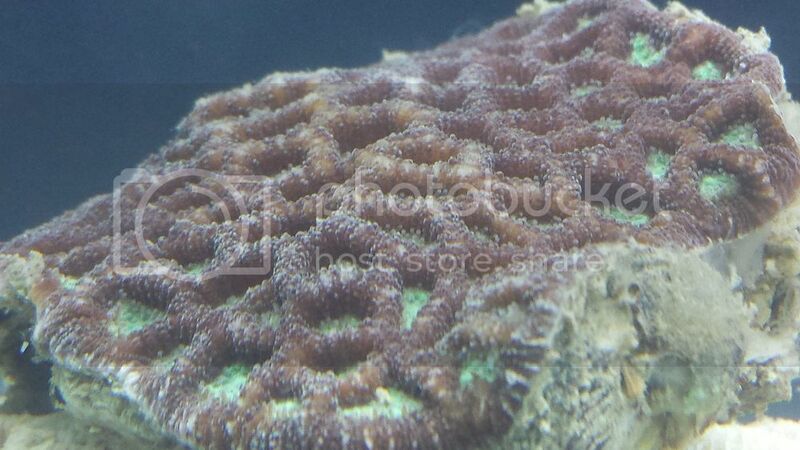 The following are the only corals I could find (I think). Anyone know what they might be? I have no clue what this is. Saw maybe 3 colonies in the area. Up to 1/2m in diameter. And I am pretty sure this is an anemone but I wouldn't be able to tell you what kind. It was about the size of my hand. There was also sea cucumbers everywhere (maybe 2 every meter or so) and I think I saw a large mantis shrimp too but all I saw was the dark red tail as it scurried under a rock. And quite a few mud skippers aswell (I think they are gobies?). Hopefully tomorrow I get some more live rock and see some even better things! Last edited by MaccaPopEye on Thu 26 Feb, 2015 9:50 pm, edited 1 time in total. Read though that thread on reefcentral before, awesome stuff, I'd be down there every low tide if i had the opportunity. As for the pics, long things just look like a type of weed to me, maybe even tree roots? Don't know. Yellow corals look like some sort of leather. And last pic is an type of carpet anemone, haddoni I think, nice colour too. Haha I am trying to make it down there as often as I can. I do shift work so I miss out on a few good tides but I can also get out on days when alot of 9-5 people couldnt. Tomorrow before work I am going to try another spot as there is a 1.4m low. But then later on in the month I wont be working when there are some 0.7m lows which could be great. I did think the long things could be weeds, they were very stiff though and had a kind of branching structure. And the anemone was very nice, best find of the day. The anemone indeed looks like a carpet, nice colour too. The yellow things are leather corals, also a nice colour. 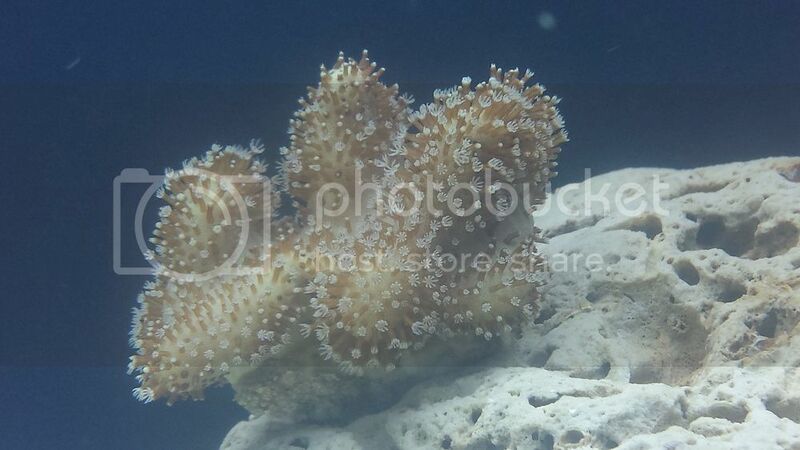 Once inflated they will look kind of fluffy - google devils hand coral. You tan take frags of the leather (cut off a chunck and stitch it onto a rock), the anemone would have to be dug out with care taken not to damage the foot, these are known to eat fish and are verry agressive but people still keep them in mixed reefs. 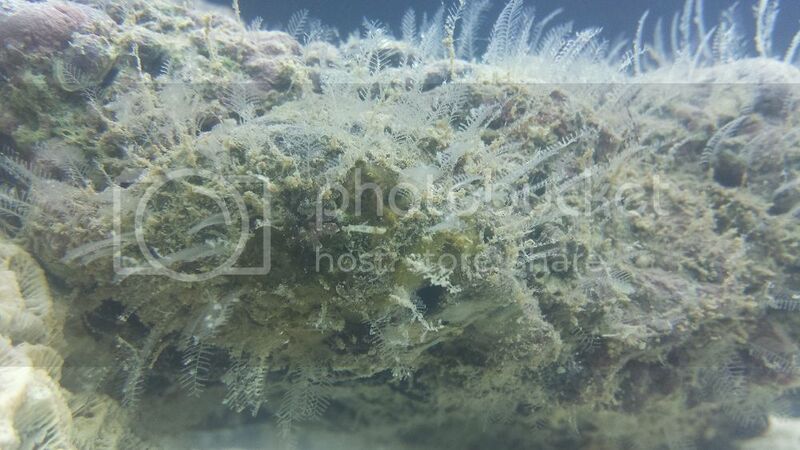 I've no idea what the long things are, look a bit like skelatons of old corals with weed growth on them. The rocks look pretty grungy and are perhaps not the best quality but would do the trick once you have cured them > investigate curing live rock this is important. Dont worry too much about what's growing on them, the general rule is to remove all suspect things (give them a good scrub) and let them cycle. Thanks for sharing, wish I could pinch stuff from the reefs in Qld, I'd take home that nem in a flash, and frag those leathers too. My tank hasn't even cycled so I cant have an anemone yet anyway, but Iv'e heard about carpet anemones before and Im not too keen on keeping one, they get too big, are aparently very fussy and there is the fact that they can eat your fish. I do eventually want some kind of anemone though. I googled the devils hand coral and that looks awesome. Again because my tank is new I wont be putting any livestock in there yet but when I get around to it by "stitch it onto a rock" do you mean glue it? And what do you use to cut a piece off? Just a scalpel or sharp knife? The 3 rocks I did get aren't pictured there, they dont have any of that weird white growth on them. I can take some pictures of them and post them up when I finish work. I am a bit aprehensive of them, they are quite heavy and a dark purple colour. Before they went into the tank I gave them a quick scrub in salt water however most things stayed on there. I thought in a new tank letting the rock cycle in the tank was the point of it and curing LR was only for when you are adding more rock to an established tank as to not start another cycle from the die off? I will be going out to a different spot tomorrow and hopefully the rock will look a bit better. By stitch it to a rock, I mean stitch it to a rock with needle and cotton, this has worked best for me in the past. You just have to hold the frag onto the rock for long enough for it to grab on by itsef. You can also try rubber bands, zip ties or just wedge it tightly between two rocks, I don't think that glue would work so well on a leather. When taking the frag, a sharp knife will do the trick, try to make the cut clean and avoid sawing and hacking. Your rock will cure, whether it's in the display or not. 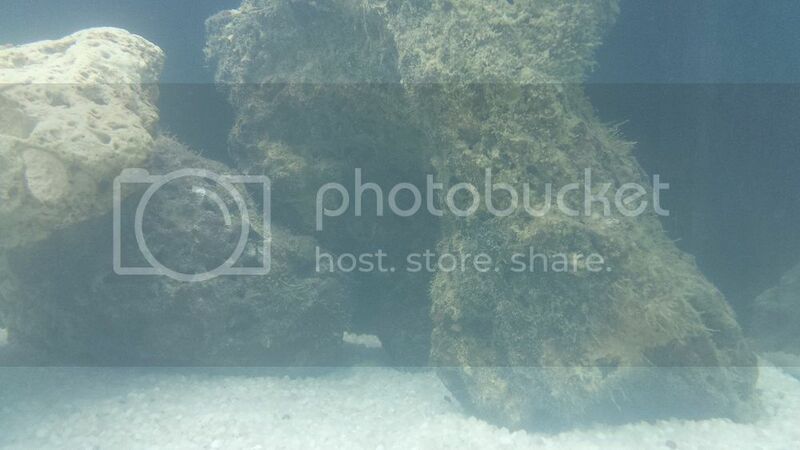 The fact is that there will be lots of die off on the rocks that you have collected as they will contain all sorts of stuff that will never live in an aquarium, this is true for all live rock, purchased or otherwise This process is called curing. During this process lots of nitrogen and phosphorous move from the rock into the water and large water changes are reccomended in order to keep the stuff that you do want alive. Live rock is live right to it's core, the surface layer is only a samll part of the life within live rock. Your rock is about to go through all sorts of changes, you'll see. Dark purple rock is good, probably coraline algae which is a good thing. BTW If you find a blue carpet anemone keep it's location to yourself. They retail somewhere between $2K-$4K and are hot property for collectors. The last one is also covered in these very cool looking feather kind of things. Any ideas? All 3 have a fair bit of algae on them but I'm hoping that it will get the cycle started. In the next couple of days I will be collecting and adding more rock to build up the aqua scape. Last edited by MaccaPopEye on Thu 26 Feb, 2015 9:53 pm, edited 1 time in total. Have you been out again? Any special finds? I could be wrong (and most likely I am) but you might want to Google Bryopsis and see if it looks like "these very cool looking feather kind of things". Magicj wrote: I could be wrong (and most likely I am) but you might want to Google Bryopsis and see if it looks like "these very cool looking feather kind of things". They look more like sea firs to me. A type of hydroid I believe. After a google I think the could be sea firs. I will have to see how they go over the next few weeks, they could die off, grow fast or even spread (hopefully not the latter). I did get out yesterday arvo before night shift. This time I went out to a channel about an hours drive out of town. Unfortunately I could not find any LR at all. However it was a 1.5m low and while the low tide only revealed about 15m either side, there was still about 50m of water in the channel and it only looked to be about 50cm-1m deep all the way along, so at a super low tide I think the whole channel would be exposed and there could be some good LR in the middle. And judging by the amount of coral I found the middle should have heaps. I saw these two as soon as I got out of the mangroves and got really excited. I would soon find that these are extremely common. I managed to catch a mantis! These little guys are really agro. They will run from you but as soon as they are cornered it's all fight. This one was jumping and snapping at everything. He was released after I got a photo. This is what the majority of pools looked like from far away. Saw alot of these teddy bear crabs this time. Alot heaps of the Emerald ones aswell and even a couple of crabs that were a really rich blue. There yellow leathers are everywhere. You can see them from the bridge above. There was also a few that were still underwater and had some amazing red polyps. Anyone know what this is? There were heaps of these, pink and blue. They look spongy but are hard. The water is a bit murky in this pool, it was stirred up by a crab running away from me. But anyone know what the orange plate was? Only saw one anemone this trip and it was out of water so all closed up. It's amazing how they can be fine out of water in 35 degree heat for a few hours. One last shot of another rock pool filled with those brain corals. There aren't any super low tides (less than 1m) for a couple of weeks. But if I wake up after night shift tomorrow in time for the 1.5m low I've heard of another spot I want to check out. This one is only a 10min drive from home so hopefully it's got alot of life. And some more LR. I really want some nice large, porous pieces. Last edited by MaccaPopEye on Thu 26 Feb, 2015 10:01 pm, edited 1 time in total. The orange plate looks very turbinaria. lol those haddons carpet anemones are tough mofo's! Well today I had another day off, and another low tide! 1.2m low this time. I went back out to the bridge but explored the left hand side this time (I was on the right hand side last trip). I still haven't found the places that Lewy in the other thread on RC goes to (I know I'm in the right area). But I still saw plenty of the same corals and some new things too. The main purpose for the trip however was to get some LR as I still only have 3 small/med pieces in my DT. Unfortunately I have had some small pest issues with my current LR (mass aptasia outbreak) so I was quite picky today and all the pieces that I found were either good looking but covered in a bright red algae (I am unsure if it is harmful or not) or they were nice and porous with no red algae but were covered in grey muck that I just couldn't get off, so tomorrow I will be trying a different spot to try and get LR. I can't believe I forgot to take a picture of the red algae, if the next spot has it too I will take a photo to see if I can get an ID. However while I was looking for LR I made sure I took a few photos (actually got so distracted that I almost got trapped by the rising tide haha). 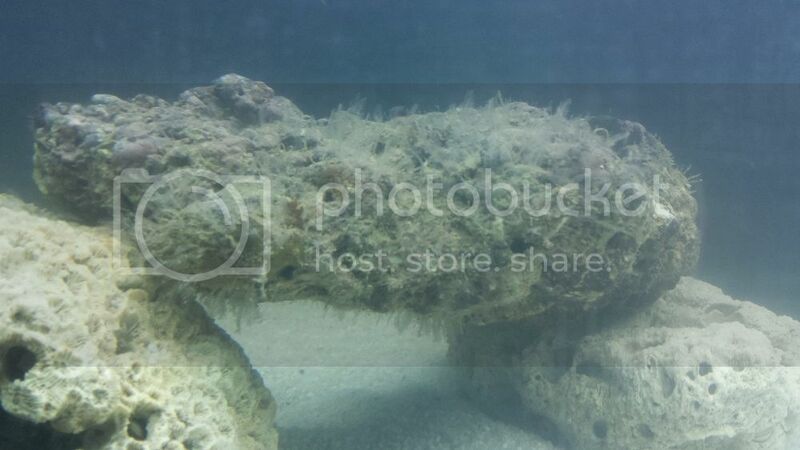 Saw alot more of these plate corals. In a few different colours too. 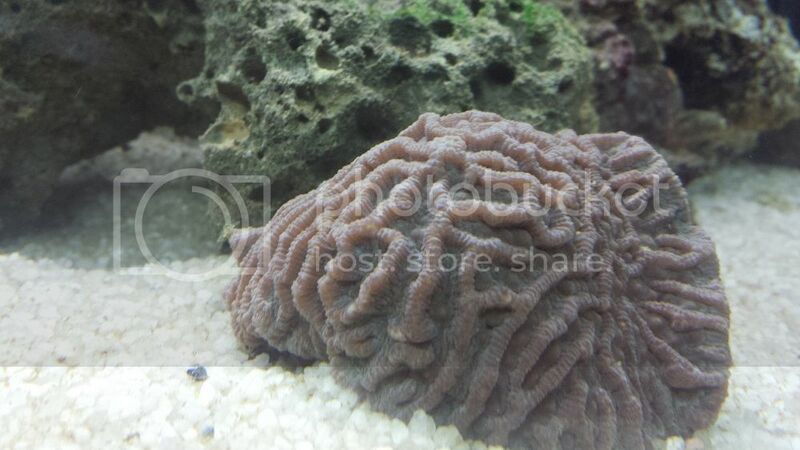 This one is definitely different to the hard plate corals. Its soft and squishy, there is also quite a few of them around. There were a few of these black ones. I thought these were some cool sea cucumbers at first but they turned out to be corals. I thought these were soft corals at first but when disturbed they withdraw the polyps and look like the other hard corals in the area. There are so many bland brown corals but then there are also so many bright greens. And that's it for today! I really hope I find some LR tomorrow haha. P.S. Thanks for moving the thread Chromus, I didn't know there was a diving and collecting section until after I posted. Last edited by MaccaPopEye on Thu 26 Feb, 2015 10:22 pm, edited 1 time in total. I assume those are the ones I thought were sea cucumbers? They were pretty awesome, I saw about 4 of them and each one had a different colour and pattern. Some had long polyps and some had short. MaccaPopEye wrote: I assume those are the ones I thought were sea cucumbers? They were pretty awesome, I saw about 4 of them and each one had a different colour and pattern. Some had long polyps and some had short. Yep that's the one, also go by slipper coral, they're a type of fungia. Those plate corals are turbinaria I think, could be wrong though. Soft, light green one with the hard base is a goniopora, harder to keep then a lot of other corals as they must be fed. Pink one is dendronephthya I think, like the goni it requires regular feeding. Yep turbins for most, think I saw a porites as well. Cool thanks for the IDs. And glad you enjoy it, but I know that I still haven't found the really good stuff that's in the other thread. I'm trying though :p.
I'll be going out whenever I have a day off that coincides with a low tide (tomorrow is the last one for a while as I've got alot of OT coming up). Today I went to another spot that supposedly has a reef but aside from a couple of brain coral that were few and far between there was no reef as far as I could find. Did see heaps of fish trapped in rock pools but they were all too fast to get photos of. Buuut I found heaps of LR! So I was finally able to fill my tank with some rock. It's not extremely live, but it's very porous, not covered in algae or grey muck and it was all from an area of ocean that is submerged 98% of the time, so it should have a good amount of bacteria on it. Hauling it back to the car was quite funny, it seems someone may have called the cops on me as I saw them waiting up near my car and watching me as I was coming back in, but they must have determined that they couldn't care what I was doing before I got back because they didn't hang around too long. I would love to go out at night with a UV torch but these areas are all very notorious for crocs, I'm ridiculously on edge during the day as is Hahaha. There are some night photos on the other thread, but I don't think he had a UV torch with him. I do actually have a small update. I posted in my TJ and forgot to add here too . As I said above for the last low tide I managed to get out to I went to a different spot and only got LR (not much out there but dead corals ). The day after that I was planning on going out but it hammered down with rain from 8am until after I went to sleep so no low tide trip. The day after that I was working. I did go out after work though as the tide was coming in (I had about 15 min before I had to climb back up the rocks or get stuck in some mangroves ) and I did actually collect my first small corals for my tank! Because I didn't have long out there I didn't take any photos (not much to see anyway as the tide had covered the good stuff). 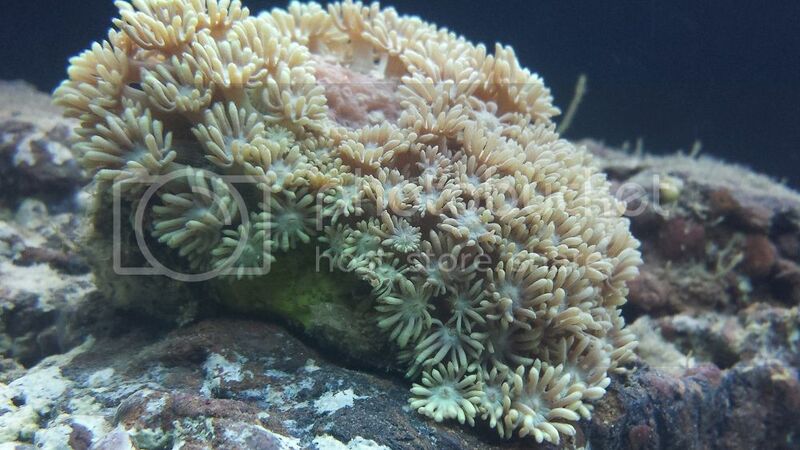 But here are the corals I took in my tank. My first find was a small leather that had been washed in on the tide. As I have had 0 ammonia for over a week and nitrite was 0.1 over a week ago and is now 0 I decided to rescue it out of the mud and see how it would fare in my tank. Here it is two days later. Here is the Goni after two days (you can see the patch starting to grow back on the top). The third and forth corals I took I am not to sure what they are but I believe they are both types of brain coral. Both photos after two days. Apart from that there are 3 low tides I can get out to this month (at the end of the month) so if everything in my tank is still healthy then I will be on the look out for some things for my tank! Either way I will be trying to get out and explore more out to the sides of the bridge and see if I can find the really good places. Man I love this thread. I am so jealous. and just go at night. Until you shine a torch across the water and see a pair of red eyes reflecting back at you. And thats where the GPMG comes into play. It was coming right for me!